Bad credit? What does bad credit actually means? How it hampers you? Many people suffer financially because of bad credit, no bank agrees to approve loan, higher insurance premiums, calls from debt collectors and many more. A person can have bad credit or no credit at all for not paying their credit card bills or monthly payments on time or missing them altogether. It also means having low credit score. Then, what does bad credit car loan means? Bad credit car loan actually means you can get your loan approved using your car title instead of your credit score. No credit check, no job requirement only your car title is required. If you’re applying for a collateral vehicle title loan for the first time, you have nothing to worry about because the benefits far outweigh any loan you’ve applied with before. Getting a collateral vehicle title loan for your financial emergencies and unexpected money problems will no longer be a problem because of the lowest interest rates and longer loan payment terms. Even first-time applicants will find the going easy and very beneficial. Since your car will be your collateral, the car must be completely owned and paid for with no outstanding loans on it or any lien on the car title. The loan amount will then depend on the true market value of your car in terms of how old it is, the make and model, and what appears on the odometer. Collateral vehicle title loans allow up to $35,000 loanable amount. Interest rates for collateral car title loans will always remain lower than unsecured bank loans and short term loans. They are the lowest in the lending industry since up to 70 percent lower interest rate can be offered against the closest competitor. Loan payment terms start off at 2 years and are flexible up to 5 years. When applying for the first time for no credit check title loans or no credit car loans one of the most important things that borrowers should know is that no matter how bad or invisible their credit history is, it has no bearing whatsoever on the loan approval. No credit checks are ever done by the lenders. At Fast Canada Cash, we loan you money based on the value of your vehicle, not your credit score. That means that you have fast access to cash whether you have bad credit or no credit at all. 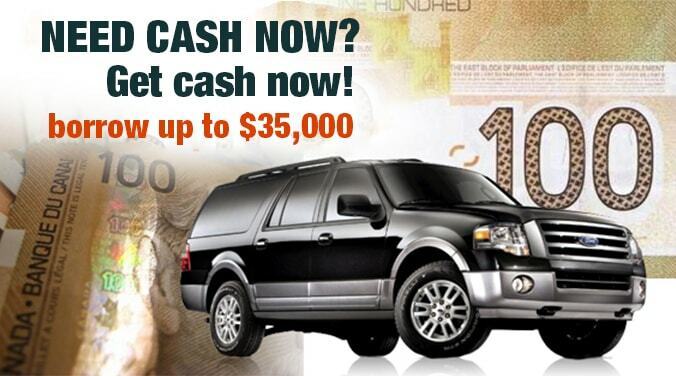 Call Fast Canada Cash toll free at 1-(888)-511-6791 or apply online for bad credit car loan or no credit car loan. It’s almost a fast-money guarantee that you can be out the door in an hour with your loan amount. We’ve got the process down pat. Be on the winning side of annoying debt. Just think of Fast Canada Cash as the beginning of a way out.